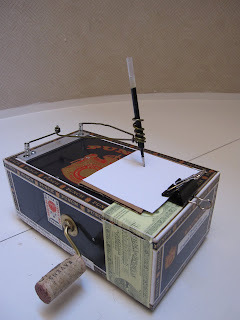 The "Drawing Automaton" is a drawing machine that is powered by magnets. Inside there is a plastic cylinder that spins as you turn the handle. Around the cylinder are small magnets placed in random spots. The wires holding the pen are held together by springs which are pulled by fishing line. The line also has magnets attached. As you turn the handle, the magnets from the line attach themselves to the cylinder, and the tension causes the springs to expand, making the pen move. I challenged myself to create a hand turning machine that can draw in every direction. Though the drawings are random, I still consider this project a great success.